René Schmidt is one of Canada's least-known successful authors. His five published books have sold over 100 000 copies in Canada and the USA and all have received good reviews from librarians, teachers and history buffs. His first published book, Canadian Disasters, outsold all other titles for Scholastic Canada in 1986 and was reprinted three times. Various editions of Canadian Disasters are found in school libraries across Canada. Rene has also written feature articles for Macleans and other magazines. René lives with his wife Shirley on 40 acres outside a small Eastern Ontario town. Besides writing, René is a retired teacher, a volunteer at a youth centre and active in his church and community. Meet his family. 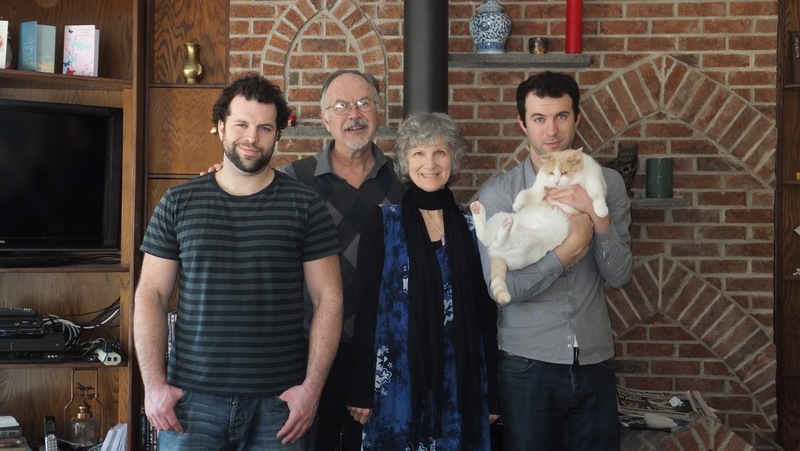 René and Shirley with Adrian and Daniel (with cat). Adrian has a masonry business in Vancouver called Ediface Masonry. masonryvancouver.ca He created the wall behind the Schmidt family. Dan teaches English and enjoys the beaches in Barcelona, Spain. Shirley and René live in a super-insulated house they built a few years ago. René does school visits frequently. 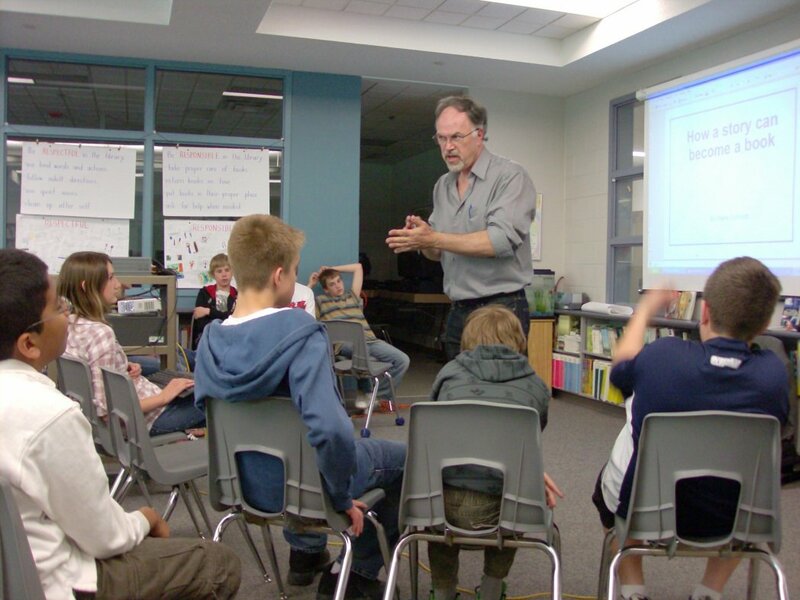 Below he gives a presentation to students in Etobicoke about editing and writing. While his career ambition was to be a fiction writer, René took a job as a teacher with the Scarborough Board of Education many years ago. He was amazed to find out how many students hated reading. When he couldn't find readable and interesting books in the library for those students he began to write his own using the students' names as the main characters. 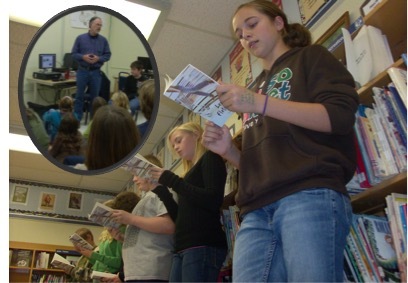 Young students stopped being an annoyance to René and he began to like using drama and historical narratives to trick reluctant students into learning. He also discovered the joy of researching and writing non-fiction. 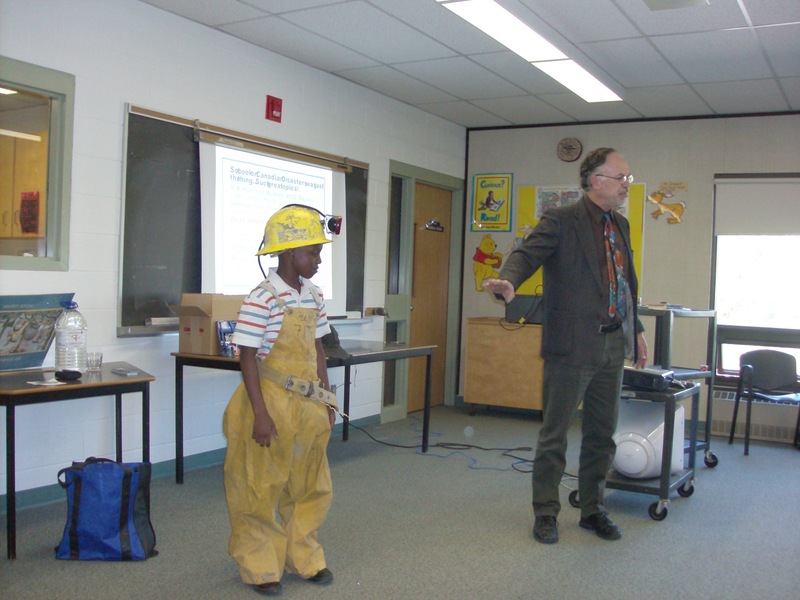 Below, talking to students about the mine disasters in Springhill, Nova Scotia, René leads into a talk on child labour laws in Canada. In the 1800's boys as young as twelve worked (and died) in the Springhill coal mines. 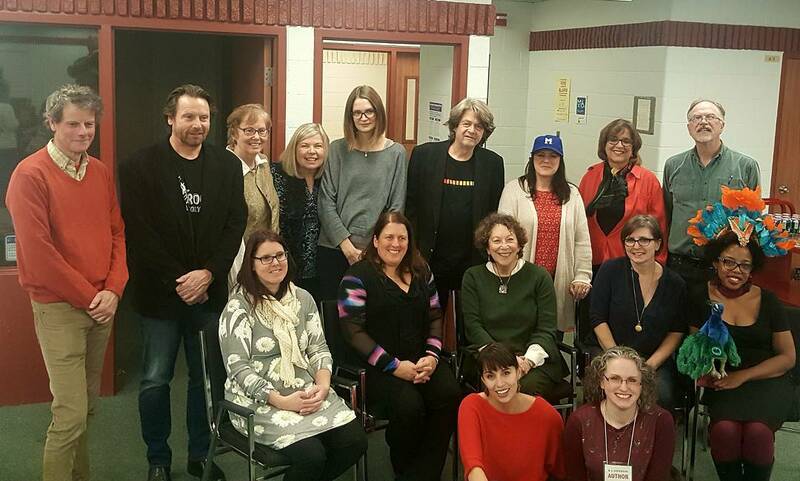 René is honoured to join fellow Forest of Reading prize-winners and nominees at an Author's Booking Service event in Milton last December. Some of the famous authors are Marsha Skrypuch (who organized the event) Ted Staunton, Sigmund Brouwer, Karen Bass, Alma Fullerton, Rebecca Bender, Kari-Lynn Winters, Robert Priest, Adrienne Kress, Rona Rimler Arato, Heather Camlot, Sylvia McNicoll, Rebecca Anderson Bohner, Irene Luxbacher and Nadia Hohn. René occasionally misses teaching. In the photo above he was given a wonderful book launch at Stockdale P.S., his last school. Kathryn Corbett (owner of Lighthouse Books in Brighton) organized it and a follow-up visit to the Forest of Trees event in Toronto where students from all over Ontario voted Leaving Fletchville second place overall. Here, his former students read their favourite parts from Leaving Fletchville.